A White-tailed Deer doe searches for food during the fall season at Squaw Creek National Wildlife Refuge in Mound City, MO. In our third of four installments of Google Hangouts with the Missouri Department of Conservation, we visit with Deer Biologist Jason Sumners. We continue our discussion on wildlife management and health, and what the responsibilities of the department are to manage those resources. Yet at the same time, it is important to remember that feedback from hunters and public citizens is crucial as to how the department can best manage our state’s resources. The Conservation Commission, made up of four commissioners from two political parties, volunteer their time over six-year terms, and take a tremendous amount of responsibility in understanding that the people of Missouri entrust them to manage the fish, forest and wildlife resources of the state. The Commission has authority to make rules and regulations. An interesting topic that we get into is the question of…Who owns wildlife? Jason does a great job of explaining that wildlife resources are owned by the people of the state of Missouri and entrusted to the government to manage those resources. Sumners explains what is known as the “North American Model,” as he goes on to describe a concept that dates back to Roman times, and how today those same basic principles are followed in seven key points. 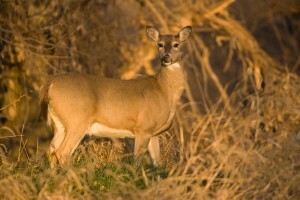 It all ties back to finding a perfect balance, in particular to deer health and population. Sumners talks about the department’s goal of using science based wildlife management to find a balance that provides recreational and hunting opportunities while limiting the risks or damage of an over abundant deer population. Sumners says it’s also very important that they receive public input. The department sends out 35,000 random surveys to hunters after each season. They also survey 9,000 production land owners on an annual basis, trying to find a balance between what a good biological deer population looks like to what is socially accepted. The Missouri Department of Conservation is currently looking for public feedback by continuing to host open houses across the state which run through July and includes the next event today (6/26) in West Plains at the Civic Center Exhibit Hall, on 110 St. Louis St.
Watch our Google Hangout with Jason Sumners and get more information below on how to voice your comments.